SANTA CLARA, CA--(Marketwired - Dec 6, 2016) - CloudVelox, a pioneer in cloud automation and orchestration software, today announced a new automated cloud network customization capability for its One Hybrid Cloud™ (OHC) software that is designed for complex data center environments. 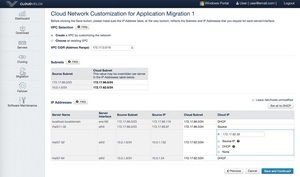 Cloud network customization enables enterprises to map their existing network environments in a data center to a cloud network design, so that enterprises can accelerate the migration and deployment of workloads without sacrificing workload compatibility or control. "Apps Associates uses best of breed products and it's great to be working with a company that enables us to rapidly migrate complex workloads into the cloud with increased confidence for our clients," said Thiru Sadagopan, VP, Cloud Services at Apps Associates. "CloudVelox's One Hybrid Cloud software helps Apps Associates to optimize, scale and manage IT resources to maximize our customers' investments." "Manual tools that use image conversion or server replication from datacenter to cloud don't do much to address enterprise cloud migration and recovery requirements," said Raj Dhingra, CloudVelox's CEO. "Large application environments have complex network configurations and for cloud migration solutions to truly be enterprise-grade, they need to address these requirements. Without automation, the network configuration process can be slow and costly, involving a lot of manual scripting which is also prone to human errors and increased risk. Our One Hybrid Cloud solution is bringing breakthrough innovation to automate how a brownfield application can be easily migrated or protected in the cloud." CloudVelox is an award-winning pioneer in cloud automation and orchestration software. Led by a deeply experienced team of system software, security and networking executives, CloudVelox provides cloud automation and orchestration software to securely move and protect workloads between data center and clouds. CloudVelox gives enterprise data center teams the ability to reduce business risk and increase IT productivity and resilience with a single solution based on an application blueprint-centric approach. For more information, please visit: http://www.cloudvelox.com.